If you want to put your videos in front of millions of people, a good idea is to choose a famous video-sharing site for it. Thereby, I believe most people including me will give priority to YouTube. To achieve this goal, you may stuck in video uploading process, then you will realize it’s not just several clicks away. There are many factors affect your upload speed. Here I will provide you with some tricks and methods to upload videos to YouTube faster. If the network speed is slow, then the upload speed will definitely not fast. In addition, other Internet activities, like playing games online, watching and downloading web video will take up network resources. So, it will help make YouTube videos upload faster by stopping unnecessary online activities, and improving network connection situation. It will take less time to upload a relatively smaller size video. So you can also decrease the file size via video conversion or compression. For example, a video file with mov extension is obviously larger than that with mp4 extension. Because, mp4 format works to strip out any unnecessary info for viewing, meanwhile it will not lower the video quality. And compared to wmv, mpeg4 is usually larger. So exporting video as a relatively light weight format will facilitate upload videos faster on YouTube. Furthermore, with professional video converter, you will be able to modify some parameter to reduce size either. 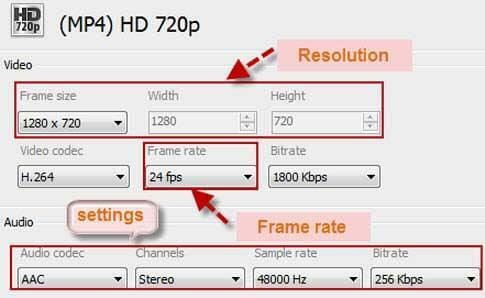 Resolution is an important factor to determine the output video size. Generally, the more higher the resolution is, the more larger the file size will be. Hence, if it’s not necessary, you’d better output videos as lower resolution with acceptable quality. For instance, if you want to create HD video, choose standard mode will finally export as smaller size. Bit rate is also called data rate, measuring in bits per unit time. And its value is high or low will greatly determines the final video size become large or small. Namely, a video that was compressed at lower bitrate will be uploaded quickly. In addition, Frame rate stands for how many frames displayed each second, which controls the playback speed. Standard quality movies are usually shown at 24 frame rates. Thereby, by reducing frame rate or bit rate to lower FPS or bits, you will dramatically reduce file size. But I have to remind you that these two elements influence video quality and playback speed, so you need to experiment so as to find proper value. Audio settings also affect size much, primarily you can change sample rate and bitrate. This is the number of times per second, ranging from 8,000 to 48,000Hz. Remember the lower you set the value, the more audio quality will lose. After you change above video and audio parameters, I believe you will have decreased the video size greatly, and found the fast way to upload video to YouTube. This video editing software is widely used by Windows users. It offers you as part of Windows live essential, containing practical features that will meet your general video editing needs. Briefly say, you can use it to split or merge video clips, and add video effects, caption, audio, etc, so that create an great video. Tip: Sometimes, you may want to get some online videos edited for making your own video. I suggest you try a free online video grab site-www.videograbber.net, which supports grab videos from mostly video websites. It supports directly publishing on YouTube, which will make YouTube videos upload faster. 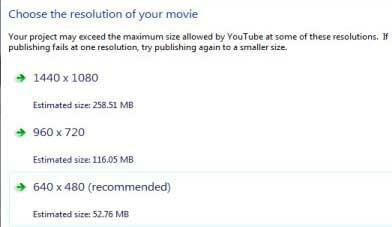 When you click YouTube icon, you will be provided with several possible resolutions, and the estimated size of each one. Pick an appropriate resolution that is smaller in size than original. Of course, there are many different free video converters or encoders will do you a good favor. Here is a list of top 10 video converter for you. 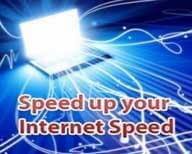 The latest version of Google Chrome, Mozilla Firefox and Internet Explorer will make the upload process go well. They also grants you recover or resume stuck or interrupted uploads. 16:9 aspect ratio will fit YouTube widescreen player perfectly, therefore viewers will get optimal viewing experience.